CEREC dental procedure is a method used by Dr. Mikesell not only to replace these fillings, but also to restore any tooth that is decayed, weakened, broken, etc. to its natural strength and beauty. Better yet, it’s done with all-ceramic materials that are tooth colored in a single appointment! So, how does CEREC procedure work? It could be a simple filling, or a full crown, depending on how much healthy tooth structure is remaining and the clinical variables involved. Next, after the tooth is anesthesized the tooth is prepared for the restoration, removing decayed and weakened tooth tissue. This preparation is similar to what Dr. Mikesell would do for many other restorative techniques. It could be a simple filling, or a full Rigby dental crown, depending on how much healthy tooth structure is remaining and the clinical variables involved. Next, after the tooth is anesthesized the tooth is prepared for the restoration, removing decayed and weakened tooth tissue. This preparation is similar to what Dr. Mikesell would do for many other restorative techniques. Next, the CEREC machine helps Dr. Mikesell create the restoration of your tooth. The CEREC 3D software take the digital picture and converts it into a 3-dimensional virtual model on the computer screen. Dr. Mikesell then uses his dental expertise to design the restoration using the CEREC 3D computer program. Within a few minutes the design is finalized and the restoration data is sent to a separate milling machine in the office. A ceramic block that matches your tooth shade is placed in the milling machine. About 10-20 minutes later, the crown is placed in the mouth to ensure proper fit and bite. the crown restoration is ready to be “baked” to crystallize the porcelain in a 700* degree Celsius oven. The restoration is then polished and bonded to the prepared tooth. Your tooth is restored with no “temporary” or return trip necessary. All of this is done in a single appointment!! Most dental offices will require two separate visits, weeks apart, in order to acquire and place your crown. 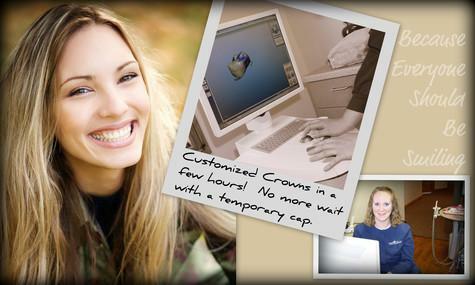 Cedar Creek Dental has state-of-the-art Cerec Technology which creates your crown the same day! Dental Implants, Dental Bridge Anchoring, Root Canal Therapy or single tooth restoration and strengthening.